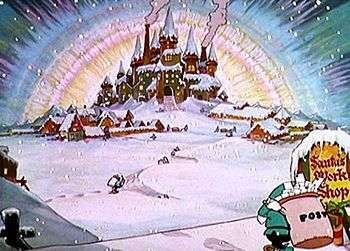 Exterior view of Santa's workshop from the Silly Symphonies short of that name. The world's first Christmas grotto was in Lewis's Bon Marche Department Store in Liverpool, England. The grotto was opened in 1879, entitled "Christmas Fairyland". A staple of Liverpool's festive season, many generations first visited Father Christmas here, with the final displays covering over 10,000 square feet (930 m2). The Grotto has now moved to Rapid Hardware’s store in the former George Henry Lee (John Lewis) building. In 1879, Thomas Nast revealed to the world in a series of drawings that Santa's workshop is at the North Pole (specifically the North Magnetic Pole, due to the aurora borealis being centered on it and the fact that the workshop was on land, properties that at the time described the magnetic pole [which was under the Canadian Arctic Archipelago at the time; the magnetic pole has since drifted off to sea] but not the geographic one). The Canada Post postal code for the workshop is H0H 0H0. The United States Postal Service recommends mail to Santa's workshop be sent to North Pole, Alaska, ZIP code 99705. ↑ Jeffers, Harry Paul (2000). Legends of Santa Claus. Twenty-First Century Books. p. 20. ISBN 0-8225-4983-2. ↑ Clements, Linda (1996). The Spirit of Christmas Past. Smithark Publishing. p. 86. ISBN 0-7651-9945-9.